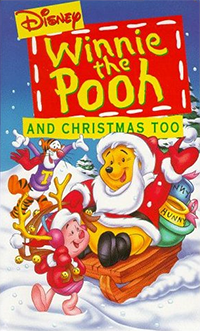 Winnie the Pooh and Christmas Too is a Christmas television special based on the Disney television series The New Adventures of Winnie the Pooh, originally broadcast on Saturday December 14, 1991, on ABC. It is also the series finale of The New Adventures of Winnie the Pooh. When Winnie the Pooh and Christmas Too originally aired, it was introduced by way of a short introductory skit featuring Michael Eisner and the Disneyland walk-around versions of the Winnie the Pooh characters. The special was then accompanied by the Donald Duck cartoons The Hockey Champ and Bearly Asleep, as well as a promo for Beauty and the Beast. Subsequent broadcasts of the special, as well as the 1994 VHS release, followed it up with the New Adventures of Winnie the Pooh episode "The Magic Earmuffs". The VHS release also contained a short Spot cartoon. Also, it was later partnered with Mickey's Christmas Carol. It was originally broadcasted on ABC. The special was broadcast on CBS in 1995. After Disney's purchase of ABC, that network once again became the home of all subsequent broadcasts. It re-aired on ABC in 1996 and kept on air until 1999. It came back on air on December 11, 2007, albeit edited down, after not airing on ABC since then. On December 10, 2008, the edited 2007 version was shown on ABC Family (along with Mickey's Christmas Carol) part of their "25 Days of Christmas".